Passion is to an author as relaxation is to a beach; determination is to a marathoner; and curiosity is to a young kiddo. They are synonymous. They are one-in-the-same. If you have kids, you know they are filled with more “why” questions than you thought possible. All it takes is the sound of the ocean to cause most people’s inner calm to take root. And while a runner I am not, I do know that even for me to jog a half-mile takes loads determination, so I can only imagine what it takes to run many! For anyone who has written a book, let’s enjoy a bit of honesty. You are not likely to spend the energy to write an entire book if it isn’t on a topic that you are not just passionate about but is probably baked in your DNA. I know first-hand that no one would put themselves through the authoring experience if they weren’t completely passionate about each word they write and the messages that are expressed with them. Passion is a beautiful thing. It can move mountains. It can motivate people. It can change lives, and when you pour that into a book, the opportunities are endless. The only problem with passion is that without a partnership of marketing, it won’t completely sell itself. As a seasoned marketer myself, I’ve observed many companies and individuals execute promotional plans to further their businesses and/or their brands. And while most have good intentions in their marketing strategies, my professional background causes me to quickly see beyond the words in an ad and the posed images on a post. I see the authenticity of every marketing tactic and believe that the businesses that have successful campaigns are ones that are built on a passion for their brand, their product, their book. Passion is contagious. It’s infectious (in a good way of course!). And while it can move people, it’s when it’s paired with the perfect marketing strategies that the bottom line is positively impacted. Keeping that in mind, while I love passionate authors who have pages filled with passionate content, passion alone isn’t going to sell a book. It may get you a meeting or an interview. But it’s when purposeful marketing strategies are paired with this beautiful trait authors possess, that the key to success happens. It’s the differentiating factor in a world filled with marketing clutter. It’s what will make you stand out among competitors, get your messages to the right people at the right time, and in the end, help your book be successful. So how do you do this? Well first and foremost, it’s important to be aware of the marketing industry, and boy what an industry it is! Outside of the information technology industry, marketing as a whole is among the fastest growing and evolving discipline around. The good news about this is that when a marketing strategy doesn’t produce the results you are looking for, there are a slew of other options. Not so good news? The fact that the industry is evolving so quickly can make your head spin as you try to determine the right strategy for you. Before we dive any deeper, let me calm your nerves on this topic. Sure, marketing is so vast that knowing where to start can be daunting. But there is one key nugget of truth you should always remember. Last I checked, there are 7 billion people in the world today! If you were to segment out 1 percent of the entire population, that’s still 70 million people. And 1% of that is 700,000 people. If you were able to motivate 1 percent of 1 percent of the world’s population to buy your book, buy-in to your brand, and want to work with you, you would have more customers than you would know what to do with! While having 700,000 customers sounds awesome – and boy would that be a successful outreach opportunity – the reality is that you wouldn’t be able to create a sustainable and authentically engaged relationship with each. So, with that reality in mind, the good news it that you don’t have to be everything to everyone, and in fact, you shouldn’t want to be! You will find a stronger ROI on any marketing effort you do if you shift your mindset from reaching “every” one to reaching the “specific” one. There are oodles of cost-effective marketing strategies that can be utilized to ensure you are reaching your target audience(s) where they are, in a voice they understand, and providing them solutions to their current pain points (your book should always be positioned as a solution to one of their problems!). If you haven’t identified a few very focused groups of people that would benefit from your book, it’s never too late to do so! If you are writing your book now, think about the person you are writing your book for. If you have already published your book, take note of the people who are engaging you most about it’s content. This is your target audience, and if you dive deeper into their demographics, you can take a targeted marketing approach that, combined with your authentic passion for the topic will be a recipe for success! This is where your passion becomes critical! With the age of the digital space, without a strong marketing strategy it can be difficult to ensure your wanted message will ever be seen by your target audience. In fact, since everyone is always marketing – whether they know it or not! – people suffer from marketing fatigue. I mean, how can you blame them when each person receives somewhere between 3,000-5,000 marketing messages a day! Our world is saturated, and because of that, we have become desensitized to them. But have no fear… you have something that not everyone has. You have passion for your topic. You have passion for your messages. And that passion should be evident in every effort you do. Coupled with the perfect marketing strategy and stellar marketing messages, it is the icing on your promotional cake. And while you may be a phenomenal writer, if you haven’t honed your passion, you are missing the largest differentiator in a sea of books on similar, if not the same, topic that yours is. Think about the brands you buy and the ones you are loyal to will likely all have a few interconnecting themes. First off, they fulfill a solution to a problem you are facing. Let’s take my favorite beauty line, Lush (if you don’t know about it, you need to check it out!). I was seeking safe skincare products while pregnant, and fell upon their products, which are made with basic ingredients that are safe for anyone! Check. It was the quickly positioned as the solution to my problem. Secondly, they have a brand that correlates with my belief system. Eco-friendly, simplistic, handmade – all things I love, and all things I am called to support. Finally, they are passionate about what they do, and they do it well. They don’t try to be something they aren’t. Sure, they have a small makeup line, but they know that’s not their area of expertise and don’t try to tout that it is. Instead, they remain passionate about their principles and produce products that they are profoundly proud of. They believe in their products, which makes me believe in them too. That is how you cut through the clutter. And as an author, you have everything you need at your disposal to take the messages found deep within your pages to the audiences who’s lives will be forever changed because of them. Passionate marketing builds brand loyalty by not selling a product (or a book) but rather providing a solution to a problem in a way that is authentic, and real because you are authentic and real. And love what you do because you believe in what you wrote, you will cut through the clutter and be able to talk to those who have been waiting for your book without you even knowing it (and without them knowing they needed it either!). All it takes is a cocktail of author-passion, strategic marketing, and a support system to help you along the way. If you’re looking for your book publicist bartender as you devise your book marketing cocktail, I may be your gal! And if we get the chance to collaborate, I can promise you that I bring a splash of passion to everything I touch as well! I already believe we make the perfect pairing! 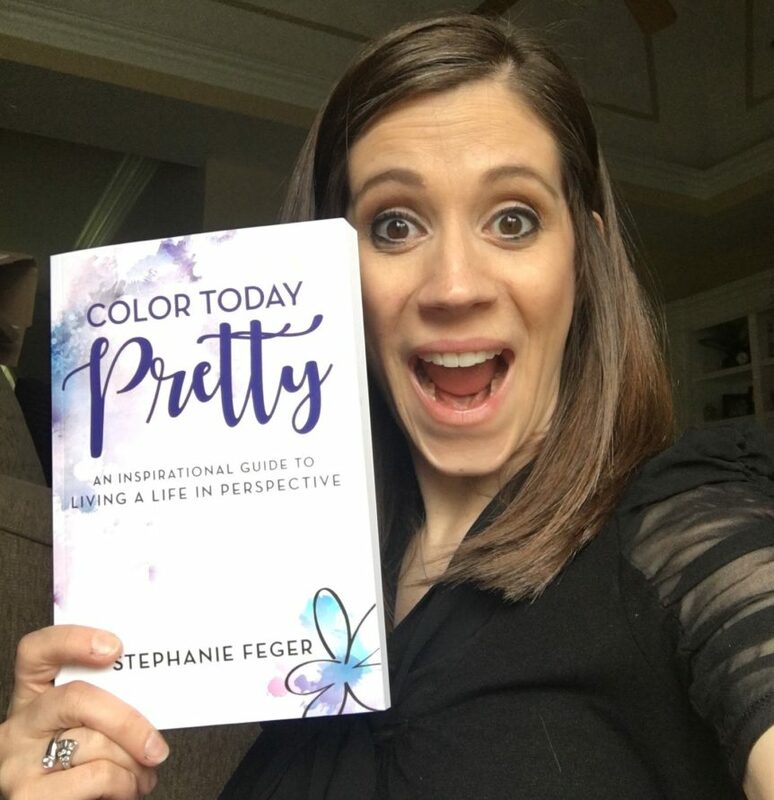 Stephanie Feger is the author of Color Today Pretty: An Inspirational Guide to Living a Life in Perspective and Book Publicist. Find out more by visiting her website.